Tired of your boring Slide to Unlock lockscreen? Want to try out something different and stylish? Well, if so HTC Lock is the tweak for you. Inspired from the latest HTC Sense UI, this jailbreak tweak brings a simple yet stylish and function lockscreen to your iOS device. Remember, you need to have a jailbroken iOS device for this tweak. 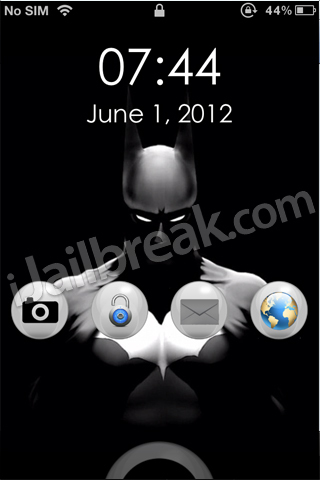 Plenty of lockscreen tweaks make it on to the Cydia Store, but only a few are truly liked and installed by the masses. This could be one of them. The HTCLock tweak is a different lockscreen altogether, it’s beautiful and all the elements work. You can quickly access the camera, messages and your emails. There is no traditional slide-to-unlock, instead there’s a nicely animated circle that you can drag to the icons and unlock, open the camera, write a new message or an email. The time and date font also looks pretty. However, I did experience some crashes on my iPhone 4S running the iOS 5.1.1 firmware. Whenever I tried to unlock or open the camera, the SpringBoard crashed, everything else worked properly though! Perhaps it’s incompatible with certain tweaks. But, give it a try for yourself anyway. HTCLock is currently available in the BigBoss repo for FREE. Right now, it does seem to have some bugs, but should be fixed by the developer soon. Try it out let us know what you think of it. Use the comments section. brings me to safe mode when i unlock .-. Same here. The other functions work, but if you can’t unlock it it’s pretty useless. don’t download that it brick your iphone or ipad, believe me guys………. hey if we can’t unlock iphone or ipad, so how we open the sbsetting app……. I have iPhone 4s and it works perfectly just drag the circle to the icon you want to open….. Free cant complaint. That wouldn’t work for everybody if you’ve changed the gestures and where they work from. You may be experiencing issues but trust me, you clearly don’t have a clue what a bricked device is. Hi, it works for me (4S 5.0.1) and I really like it except; 1) I’d like to be able to choose which 4 apps to unlock 2) the lock screen works when connected to computer/power source (I just get picture of the battery, no way to unlock). I hope this is popular and the developer helps fix a few things so that everyone can use it, and imo, the best lock screen available. i can’t unlock my iPhone after i installed and resprung my iPhone !! help !! nothing shows on the lock screen except a battery !! In that case its not bricked! hey man. im facing the same prob. now i ant even boot my ipad.have u found a solution? Love it. Very smooth. Only problem is I choose the captain America shield but my unlock circle doesn’t change. Is there an apply button I’m missing or something?? HELP!!!! I cant unlock my device! im using an ipod 4g with 5.1.1 and redsn0w. ive installed the HTClock and i cant unlock it. i need to reboot tethered. please help me! i need to remove this tweak! Running great! The only problem I’m having is the configuration in settings, not able to make any changes. Any ideas?